Born in St. Louis, Missouri, my family travelled to Germany, New York, Taiwan, Arizona and Texas as I grew up. My first art lessons were in Taipei, Taiwan. My faith journey has been nurtured in many places and churches but it was with the missionaries in Taiwan where I became a Christian. While I continued art classes in college I completed a BA in dance and spent time performing, teaching and choreographing. I worked in the corporate world for sixteen years. Then not wanting to travel with a new baby I went into partnership with my husband in a consulting, marketing and graphic design business while we raised our son. During this time I was inspired by my work in Christian education. Years spent helping Sunday School children with creative expression of story themes and symbols revealed the artist in me in new ways. I wrote and designed Christian education publications, created story materials and led teacher workshops. In sharing meanings of faith I found myself increasingly using visual expression to help the children and myself seek understanding beyond words. When my son went to college I went fulltime into my artwork. 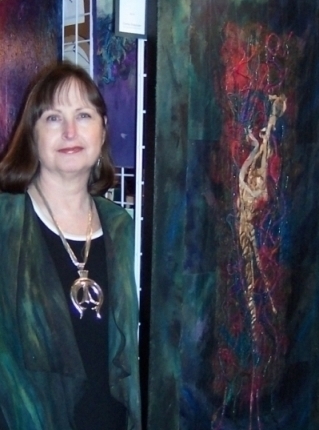 My art encompasses a diversity of mediums including acrylic, mixed media and fiber in seeking visual expressions of faith. Time in the workshop begins with the day's reading from My Utmost for His Highest by Oswald Chambers. Often I am wrestling with a concept, problem or question. How to portray forgiveness and redemption? How can brokenness create a new wholeness? What images give glimpses of sacramental meanings? How to tell the story of salvation in shape and color? How can beauty and love and faith be visualized through pain and suffering? 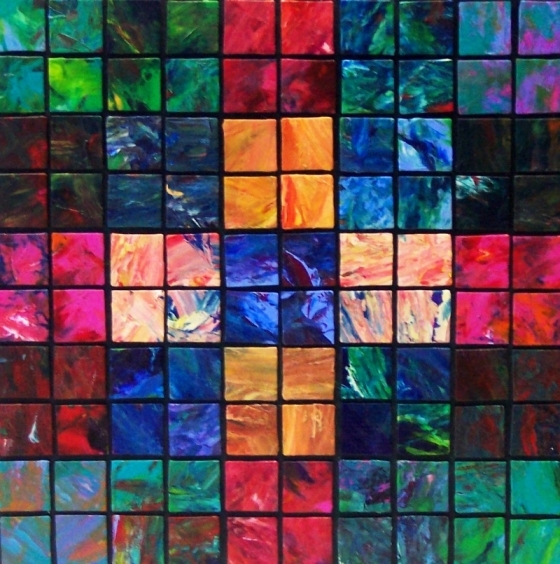 How can I reveal different aspects of the cross of Christ? What images help to seek and follow Jesus in daily life? Initial play with materials using a wide variety of mediums, surfaces, techniques. Resulting pieces/components of various sizes are reviewed, assembled and reassembled. Components are created over weeks, months and sometimes years. Selection is made of the results and a new work is begun. Once the direction and vision is formed, the composition is finalized, materials are set in place. New components are created as needed, with additional drawing and/or painting. Each work is reviewed frequently over time, with adjustments until it is complete. My artwork often begins with Scripture: it is part meditation, part struggle, part joy. At other times I cannot connect with words at all: it is part emptiness, part hope, part prayer. How can I visually express the sense of God’s presence I find in Scripture and The Book of Common Prayer? It is a search for ways to suggest in color and shape the life of the Spirit I find in writers like Henry Nouwen, Madeleine L’Engle, Thomas Keating, Sister Wendy Beckett, Oswald Chambers and N.T. Wright. Many times it is begun and ended in pure play: joy in the colors and shapes, joy in the feel of the materials, ‘joy in the Lord’ as I seek to give visual expression to God’s saving grace in my life and in the world. 1. Dance, 61 cm x 122 cm, fiber and mixed media. 2. Gift, 41 cm x 51 cm, mixed media. 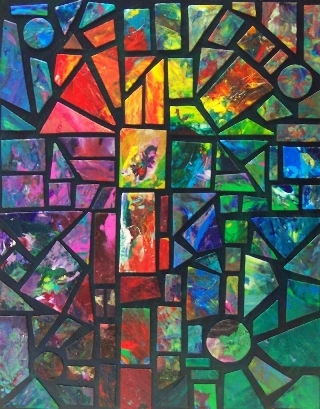 Separately created pieces comprise this work reflecting how we, in our separateness, with our rough and jagged edges, our smoothly crafted facades and our colorful inconsistencies come together in Christ. 3. Together in Christ No. 5, 30 cm x 30 cm, mixed media. This Scripture brings me a sense of peace when fear, anxiety or sadness mount from dwelling on circumstances in the headlines or in my life. Christ's redemptive power is at work in ways I cannot see or understand. Unity and wholeness come from separateness and brokenness -- for all things hold together in Christ. 4. Oblation No. 2, 61 cm x 51 cm, acrylic. 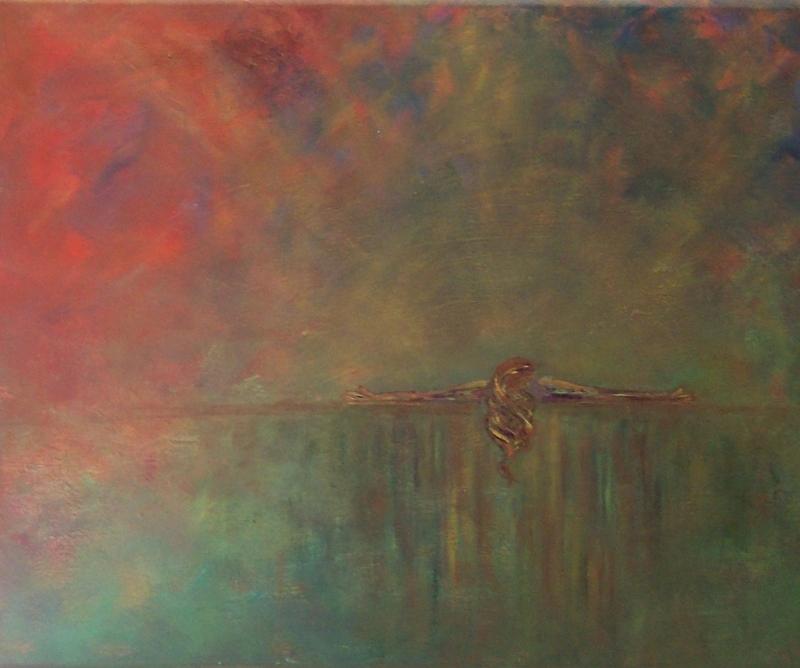 The Oblation series is a visual expression of times to kneel before God with head bowed, heart open and arms outstretched. For I cannot make myself “holy and acceptable”, I can only offer myself…the rest is God’s work. 5. The Life, 27 cm x 31 cm, acrylic. From the cross of Christ through the powerful presence at Pentecost to the moments and days of my life comes the gift of the Holy Spirit. 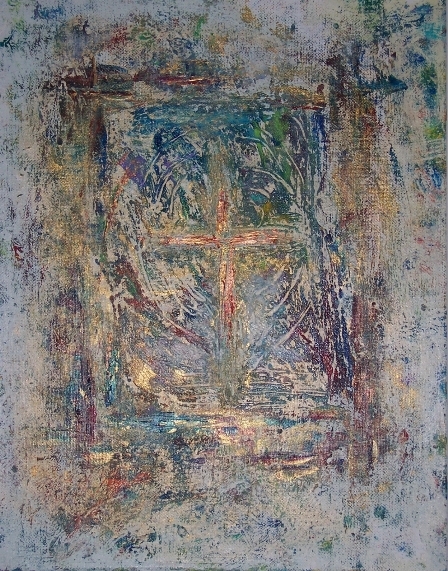 I seek to keep mindful of Christ through my artwork, which frequently involves the image of the cross. And as I keep my art materials, my hands, my heart and my mind on the cross of Christ, by the power of the Holy Spirit – Truth is revealed, the Way is shown, and Life is given.